Though we generally file match-three titles under the puzzle genre, there isn’t often much that’s puzzling about them. Swap a few gems, watch cascades collapse—all good fun, but not exactly a stimulating mental challenge. Cubis Creatures [$0.99 / Lite] is one of the rare matching games that requires—and rewards—putting on your thinking cap. Cubis Creatures is based off the popular PC game Cubis. It shares the same fundamentals: an isometric view, a grid of cubes, and loose cubes you shoot into the mix from two of the edges. But Cubis Creatures is entirely its own game, with plenty of great matching and a side of adorable art and cutesy creatures. Not a bad combo, in my books. If you pick up Cubis Creatures, you’ll get access to four creatures, creatures that must be woken by, err, matching cubes in their mouths. Each one gives you 20 levels to work through, and there are two more critters available for purchase. That’s a hefty chunk of content, but if you manage to burn through it you’ll be happy to know there are also daily score tournaments that are well worth checking out. Now things get complicated. Cubis Creatures is played on a square grid that has three vertical levels, only the bottom of which you can actively effect. You can slide cubes in from two of the sides, and they’ll continue on until they hit an obstruction. If that obstruction is solid, they’ll stop. If not, they’ll knock it forward a space first. If there happen to be two other cubes of the same color at that location, they’ll match and clear off the screen. If you’re lucky or clever that will set off a chain reaction, a combo (or “cubis") or more skyrocketing your score. 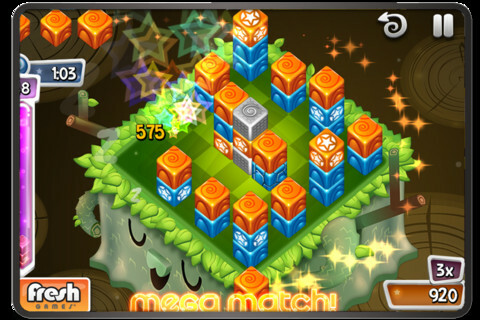 Each level has two meters: a timer and a cube limit. Hit the latter before the former runs out and you’ll complete the level. But to do things right and claim three stars you’ll need to collect all the star cubes in the level. Suddenly it doesn’t necessarily make sense to make every match, because if you hit the cube limit before collecting all the stars you’ll rake in a lousy score for your efforts. Yeah, that’s right. Strategy time. There are a lot of ways to manipulate the board, randomly granted as they might be. You can launch bombs that scatter the cubes they don’t blow up. Lasers can take out any single cube, no matter how impenetrable. 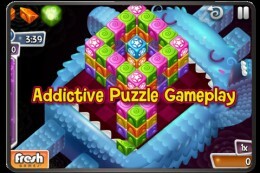 There are even dual-colored cubes that can (and must) match with both colors before clearing. You’ll need them all, because the level designs get increasingly devilish. Many can be puzzled through, leaving you to pick the right spots to set off the perfect chain reaction. Others require a good dose of brute force. Cubis Creatures is both smart and fun, making it a worthy successor to the Cubis titles of old. It also fits in nicely amongst its modern peers, with Game Center support, lovely art, and a cheery soundtrack—the whole package when it comes to top-notch presentation. It deserves a look, whether you’re a long-time fan or a first timer. And really, who could say no to such darling creatures?